Under yellow and black mood lighting, 37-year-old Bahamas frontman Afie Jurvanen confidently lead his band onto the stage at Paradise Rock Club Friday night. The audience abandoned their conservations, which had intensified during the band’s opener. Flannels and beanies paraded across the quaint venue. People in the crowd seemed relieved to escape the crisp October night air and eagerly awaited the indie-folk experience. Densely packed, there was little space to spare in the audience for all the 20-somethings desperate for the perfect view of the stage. Without a single spoken word, Bahamas began with “So Free,” a song from their latest album, “Earthtones.” The slow tempo concentrated on smooth folk melodies that delicately blended the guitar and vocals together. Backing vocalist Felicity Williams added high pitches that perfectly matched the guitar and the telecaster without taking any attention away from the instruments. “I’m surprised you guys are all here, isn’t there a big sports event?” Jurvanen said, referring to the third World Series game. He spoke with a humorous charisma that engaged the audience. It was all too easy for Canadian-born Jurvanen, whose audience ate up every quirky, yet intelligently spoken comment he made about the band and the atmosphere. Accompanied with a full band for this tour, Bahamas’ musical direction centers around the guitar and the variety of melodies Jurvanen provides. The drums and bass are mere backdrops compared to the power of the guitar, which Jurvanen indicated that he has an endless love affair with. The “Earthtones” album exemplifies the band’s overall musical direction more cohesively. The sound is bound together consistently by the band, giving Jurvanen less wiggle room to jump between genres. Concertgoers erupted at the familiar rhythmic patterns of “All The Time,” a universal fan favorite dominated by rock influence. Although the song comes with undeniable popularity, it is unlike the band’s usual indie-folk and alt-country style. It comes from the band’s 2014 album, “Bahamas is Afie,” a personal confirmation for the frontman as an evolving artist. Once used in a Verizon commercial, “All The Time” has a tropical, beach-like tone. However, much like the “Earthtones” album, the song also relies on electrical guitar notes. Jurvanen encouraged this abrupt shift that ventures out of the traditional folk melody. 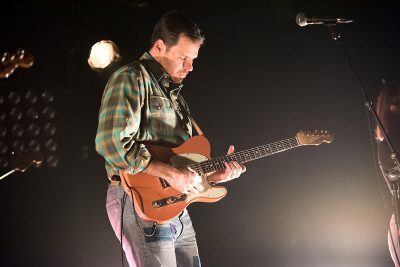 Unannounced, he reverently moved from country and folk to bluesy guitar solos, cuing the crowd to explode with excitement. However, during the concert, Bahamas’ acoustic genius was narrowly revealed, if it was even exhibited at all. Peacefully lost in his solo, Jurvanen said that he “could do that all day, it’s so fun.” With sprinkles of laughter, the audience condoned each hybrid solo, different in tempo and style. Specifically, the song “Bad Boys Need Love Too” electrified the crowd’s energy. As the longest of his guitar solos, Jurvanen disappeared into a creative landscape, which was overwhelmingly approved by the audience. Between numbers, a man yelled something inaudible. Jurvanen utilized this opportunity to connect with the audience. Nearing the end of the set, the band played a classic favorite: “Lost In The Light.” To highlight the reminiscent dispute between the song’s two lovers, the stage lighting composition was heavily manipulated, alternating between being obscured and intensified. The fast-paced changes in light exposure encapsulated the nostalgic mood driven by the music. Aware of the lyrical power the song possesses, Jurvanen exaggerated the line: “Before we were lovers I swear we were friends.” He sang in crescendo with the audience, who matched the intensity. The lights dimmed on cue while Jurvanen slowly reached for his well-concealed flashlight to spotlight the beauty of an additional instrument. The variety Jurvanen provided to the audience elevated his deep admiration for the guitar. There is no cohesive tone he strives to follow. Rather, he enjoyed the exploration process of moving between contemporary genres that can focus primarily on the brilliance of the guitar. Bahamas’ dynamic ability to defy a single genre and explore a plethora of arrangements is a beautiful talent, one enjoyed by the crowd and deeply encouraged by loyal fans.